-Wiz Khalifa will be performing the smash Black and Yellow before the game on Sunday. As Bill Simmons would say, "Enthusiastically co-sign." This should be the Steeler anthem for the next decade. Debate closed. -Sports media members are all writing the same Ben Roethlisberger story, says Fire Rick Reilly. -And on that note, are the Steeler fans in this photo really how the national media sees us? I'd say that's bordering on incredibly sad. What's the message here? "OK Ben, you have to answer for your misdeeds to these grown men dressed up like it's Halloween." 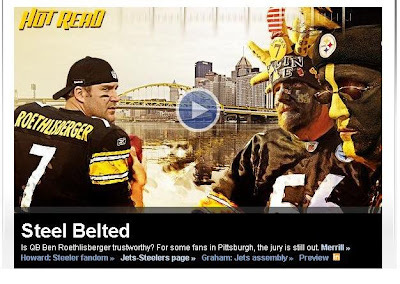 Does anybody know the story for the guy wearing the Tomlin Time hat? He used to wear the Cowher Power hat. He comes all the way from Baltimore every week to watch home games. That article on ESPN was bogus. Nobody in Pittsburgh cares about Ben's suspension or off-the-field issues anymore, as predicted. @Bar Keep: That's pretty cool. I wonder what keeps him in Baltimore, though? It seems like it would make a lot more economic sense to just move to Pittsburgh...that's got to be a killer trip on gas and lodging every week. He must either have strong family ties or a great job in Baltimore. I love my home city, but I'll pass on the shi**y rap, thanks. Cowher also picked the Hurricanes over the Pens before Sid and Geno got out the broom in the '09 playoffs. Everyone knows that the Wiz song has nothing to do with steelers football, right? Or are we all that ignorant? @Adam- hahaha. Would that be similar to hewhosnameshallnotbespoken's 'cell phone incident'? What did we win in that bet? @Eric - what bet are you referring to?